Architecture is driven by three factors: function, budget, and style. Budget influences building size and materials. Style and function are often based on the time period of construction. I feel this is true of retail architecture in downtown Geneva. 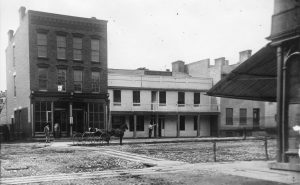 The earliest downtown images we have are from the 1870s. There are 19thcentury newspapers prior to that time that describe downtown buildings. There was a mix of materials and sizes and residential and business buildings. 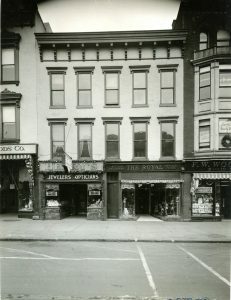 This photo of the south side Seneca Street, taken from the Linden Street corner, shows, left to right, the old Post Office and the Mansion House hotel. The Post Office building was fairly typical for the later 1800s. The patterned brick cornice and decorative drip molds over the windows added style. The multi-pane floor-to-ceiling windows let in light and allowed people to look in the store. Large single-pane windows were still in the future. 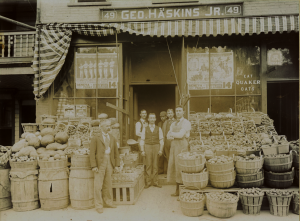 George Haskins’ grocery at 49 Seneca Street shows another example of the style with a different function. Unlike today’s supermarkets, most of the goods were behind counters on either side of the store and customers stayed in the center. Customers gave their list to the clerks who filled the orders. There was no need for multiple aisles and the flanking windows showcased the goods inside. 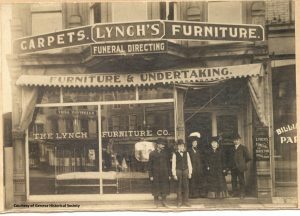 After 1915 Lynch’s moved to a new steel frame building at 485-489 Exchange Street. Steel supports, covered with brick facing, allowed for larger windows on all floors and minimal decoration on the façade. This was the Chicago Style of commercial architecture. “Chicago windows” usually had a large fixed pane flanked by side windows that could open for ventilation. A true example of such windows are next door at the Antique Co-op. 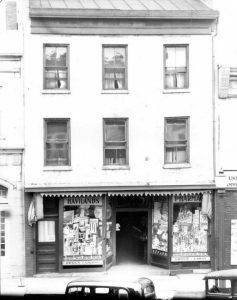 28-30 Seneca Street was a traditional masonry building with two storefronts and a central staircase leading to the upper floors which might be offices or apartments. Like grocery stores, the retail spaces were narrow and customers stayed in a center aisle. 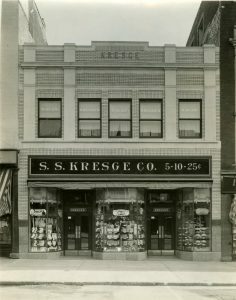 In 1928 the S.S. Kresge Company purchased the building and tore it down for a new single-use space. There were two doors and multiple aisles so shoppers could pick their own goods. The second story didn’t extend the full depth of the building but was only large enough for an employee lounge. The building had Chicago Style simplicity with little trim on the outside. 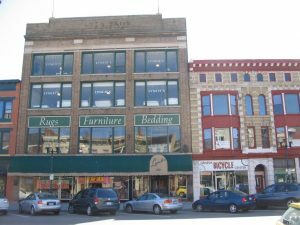 Building owners kept pace with changing styles by updating the facades. 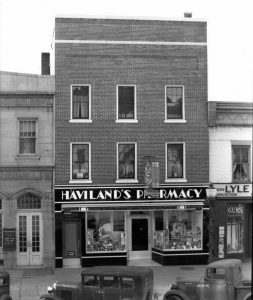 Haviland’s Pharmacy at 418 Exchange Street was a plain building, lacking the window or roof trim shown in other buildings. The front entry looked dated as well. Sometime in the 1920s the owner added a brick veneer adding height to the building and giving it texture. Black structural glass and Art Deco lettering made the store front look modern and competitive. Modernization increased in the 1950s and 1960s with more façade alterations, demolition and construction. Fortunately there is a renewed appreciation by owners and shoppers alike for Geneva’s architecture. I really enjoyed this especially the grocery and the 1870ish newspaper building. I still wish one of your bloggers would do something on the early Irish in Geneva. I think my great grandfather Mulcahy and his son laid most of your early sidewalks.